As columnist Gregory Rodriguez recently pointed out, the number of Americans who checked both “black” and “white” on their census forms grew by 134% from 2000 to 2010. (Among non-Hispanics, about 1.6 million reported being both black and white, but not any other race; among Hispanics, about 654,000 did so.) Rodriguez lamented the president’s decision not to include himself in more than one racial category. 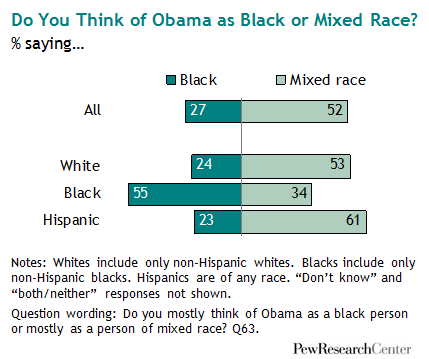 The perception of Obama’s racial identity is quite different among black and white Americans, according to a Pew Research Center survey on race in late 2009 that asked respondents “do you think of Obama as black or mixed race?” Among non-Hispanic whites, 53% said the president was mixed race, but 55% of non-Hispanic blacks said he was black. Among Hispanics of all races, 61% said Obama is mixed race.